Today’s Japan boasts the second largest music market in the world. The music scene has exploded to include Japanese styles of rock, heavy metal, hip hop, punk, and whatever else you can think of. A lot of today’s music from Japan would seem to be an adaptation of these styles, using the Japanese language. Yet there are also genres that mix western influences with Japanese traditions and structures such as Japanese Pop, or ‘J-pop. There are also many important classical musicians and first class ensembles from Japan. Composer Toru Takemitsu is known for his classical compositions as well as for movie scores. Seiji Ozawa is a famous conductor whose career has spanned the globe. The Tokyo Kosei Wind Orchestra is one of the world’s leading wind ensembles, and nearly every Japanese city has at least one first rate orchestra. Japan’s musical roots are strong and date back to at least the 6th century, when delegations from Japan were sent to China to learn about the music and culture there. Besides China, influences in early Japanese music come from as far as India. 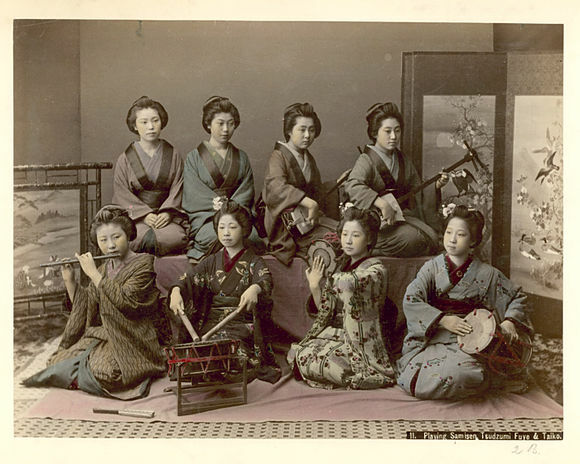 As musical styles and forms emerged, some characteristics began to distinguish Japanese music. Sparsity of rhythm and silence are integral to the general musical style which is based on the Japanese concept of ma, or the calculated use of space or time intervals within the musical structure. Furthermore, the style was noted for lacking regular chords. The underlying principle was that the music strove to correspond to nature. The oldest music genre was likely gagaku, which was form of court music incorporating dance and song. The gagaku tradition was perfected and preserved primarily by three guilds representing Osaka, Nara and Kyoto. In Kyoto, gagaku thrived for centuries, peaking in the 10th century, then declining with the rise of the samurai. With the event of the Onin War, during which much of Kyoto was destroyed, the tradition ceased for about 100 years until it was revived by the Tokugawa government of the Edo Period. Other early musical genres included the shōmyō, a Buddhist style of chanting, and an early form of Japanese folk song known as minyō, which came from the common people who would sing the songs during work or play. Traditional Japanese music was performed on a wide range of instruments, many of which first came from China. The koto is considered to be the national instrument. 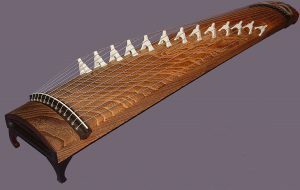 It is typically constructed from kiri wood and has 13 strings that are played with picks on three fingers. 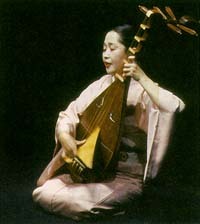 A biwa is a short necked lute with four strings, similar to the Chinese pipa. It was commonly used to accompany storytelling in song. One of the several traditions associated with the biwa was its use by blind performers. These traveling performers made a living by entertaining, performing in rituals or playing for alms. Thought by some to have special powers, these blind performers were immensely popular during the 13th and 14th centuries. 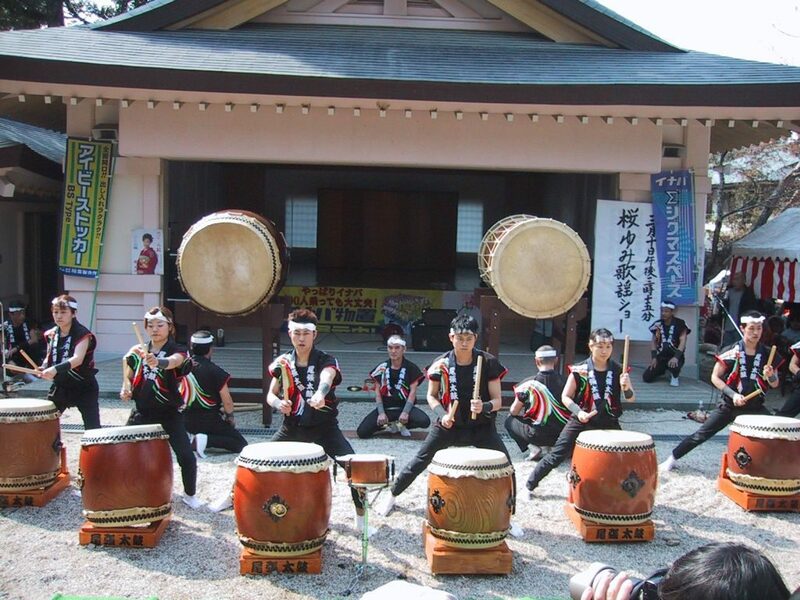 The term wadaiko, or taiko, for short, refers to both a style of drumming and the drums themselves. The shakuhachi, a traditional bamboo flute, the shamisen, a three stringed instrument, and the kugo, an angled harp, are further examples of traditional Japanese instruments. 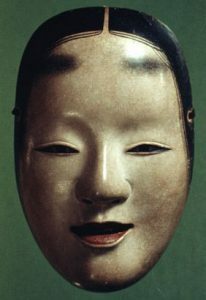 The word noh means skill, or talent, and is the name attached to one of the oldest theater arts still performed today. The Noh play is a type of theatrical performance dating back to the 14th century which depicts traditional tales in a highly stylized manner with costumes and masks. The masks typically represent ghosts, women, children or the elderly. 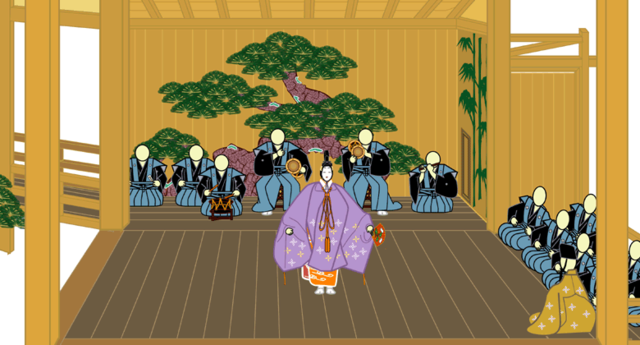 A Noh program consists of Noh plays with shorter comic performances called kyōgen, performed between them as interludes. Although a program can be shortened, it usually is made up of five Noh plays. The performers usually include a small chorus, instrumentalists and a character known as the shite, who is the main protagonist and a waki, who plays the antagonist role. 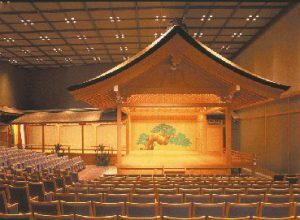 The combination of Noh plays and the contrasting kyōgen interludes are often referred to together as Nōgaku theatre. 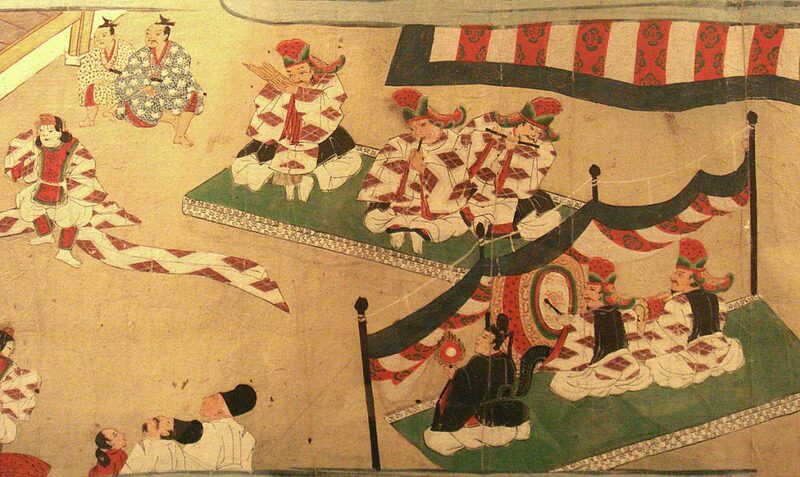 Once a highly favored form of entertainment for the Shōgun, this courtly art originally featured only male performers. Since the 1940s, women have participated as well. In 2009, there were thought to be about 1200 male performers in contrast to only 200 female performers. Towards the end of the 19th century, the popularity of Noh theater lessened, but regained prominence in the 20th century by catering to foreign diplomats and the general public. In 1983, the National Noh Theatre was established for the training and performance of this unique genre. The video below is fascinating to watch. It contains clips from Noh and kyōgen performances. The stylized movements, masks and elaborate costumes demonstrate the unique elements of this ancient art form. Another form of Japanese theater is Kabuki. This was a form of entertainment popular with the middle class. Also highly stylized and costumed, Kabuki combined singing, dancing and stock characters, such as the ‘handsome lover’, ‘virtuous hero’, ‘evil samurai’ in performances by male performers who came from family dynasties. The female roles performed by these men, were known as onnegata, and included parts such as the ‘high lady’, ‘young maiden’ or ‘wicked woman’. Kabuki originally had female performers, but due to incidents of prostitution, the Tokugawa Shogunate banned women from the Kabuki stage and henceforth the performers were all male. 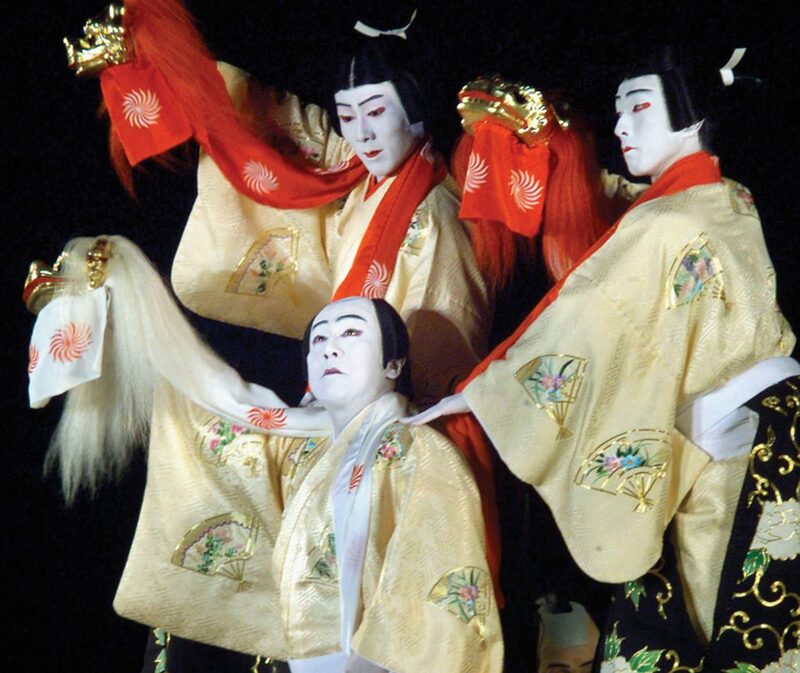 Tokyo, Kyoto and Osaka have acclaimed stages for Kabuki. Although it is a highly melodramatic and colorful art form, the uninitiated will likely be satisfied with about a half hour’s worth, and it is perfectly acceptable to get up and leave at any time during the performance. With the arrival of the 20th century, Japan began to take notice of Western musical trends and responded by either combining them with Japanese structures and styles, or adapting them completely, though generally in the Japanese language. The term rōkyoku refers to a style of storytelling in song accompanied on the shamisen. It probably originated towards the end of the 19th century in Osaka and is notable for producing the first big musical stars. In contrast to this fully Japanese style, is the kayōkyoku, a somewhat broad term for Japanese music that incorporates Western influences. Shoka was one of the first musical forms to borrow from Western music. It was intended to introduce western style music to Japanese schools. The gunka was a Japanese style military march. In the 1930s, jazz made it’s mark, although during World War II it temporarily was considered the ‘music of the enemy’. In the 1950s, the influence of Latin and Cuban music arrived. The 1960s brought rock music. The category known as J-pop, which is short for Japanese Pop, took hold in the 1990s and effectively replaced kayōkyoku. J-pop is mostly free from Japanese structures and uses a special English-influenced pronunciation. With such a large music scene, there are countless styles and variations in today’s Japanese music. The ancient musical traditions of the past are likewise rich and varied and invite further exploration. Honshu’s large cities are home to a large number of opera houses, concert halls and performance venues and offer spectacular performances from world class ensembles. Unquestionably, there is something for everyone! One last video. This one is just a quick taste of Japanese culture with a wide variety of video clips and some nice background music.